Everyone loves Blogger because it possesses numberless features, which attract a publisher like a bee to a honey. There is no doubt that Blogger is not the leading blogging platform but still it is giving a real hard time to WordPress (Most preferred Blogging Platform). The only thing which makes blogger 2nd best blogging platform is it’s instability towards designing. Nevertheless, this post is not dedicated to the greatest debate of all time Blogger vs. WordPress, today we will be discuss “The Things Which We Need to Remember before Making Any Changes in Our Blogger Template”. If you are our frequent visitors (loyal Reader) then you possibly have noticed a slight change in our Template from past two days I have been working to optimize my Blogger template, and so far it has given quite perfect results. This is the reason why I thought to share my views so you may not get stuck in a chunk of coding while editing your template. To edit or personalize a blogger template you need to learn the basics of HTML and CSS, you don’t need to spend lots of money in learning advance HTML coding because basics things are required to edit a blogger template which can be learned from Internet (Just Google It). Usually Blogger Template revolves around IDs (<div id>) and Classes (<div class>) so if you aware from HTML and CSS IDs then you will not feel any stress while editing a template. It appears extremely illogical if you straight away start editing your template without even creating a backup. Usually new bloggers don’t realize the significance of the template they take it as noting, and that causes them a significant decrease in their Traffic. For instance, while editing a Blogger template if you committed a childish mistake then nobody can save your blog from becoming the mother of all the messes but if you had downloaded the backup before editing your template then it could be a life saver. 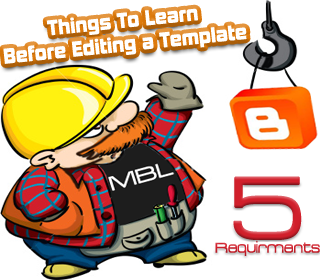 To download a Backup of your Template Go to Blogger >> Template >> BackUp/Restore >> Download Full Template. Changing a blogger template on regularly is not consider as the most desirable act, because Blogger has no additional files in it thus the entire SEO functions depends solely on your Template. If you are getting tons of visitors, then changing a blogger template is not the right choice as it will entirely kill your Search engine ranking. If you want to do slight optimizations in your template then make sure you don’t do loads of changings because doing many changes might confuse the search bots, and they might rank you down so do changes in small packets like once a week. It’s always proved quite promising if you work with a team of dedicated workers, try to divide work load so it may take less time and would give most prominent results. I will not recommend you to create a team of more than 2 members because you will not require more than that. You may divide departs like one member should work on CSS Style sheet while other concentrate on building correct HTML structure. Blogger templates are designed with XML language so if you would try to optimize it on your personal HTML tools, then it might run on your Local-Host but it will not execute properly on your Blogger blog and will give you common errors like “the template is not well formed” so be conscious while editing your template, and try to preview after every editing interval. Currently we have reshaped our Navigation menu and are trying to optimize our Sidebar plus Post body. We apologies for any errors that you may have faced while this up gradation. We will make sure that the site remains active while we are performing maintenance. In this week, you will continue to see lots of changes in designing but don’t forget to send your suggestion till then peace, blessings and happy designing. Your theme is now amazing. Keep up the good work. I like this theme very much, looks very good.